To the visitor it may seem picturesque. But when you've spent several hours a day for 20 years vigorously shaking a dead goat's stomach filled with milk to make butter, the novelty has long worn off. 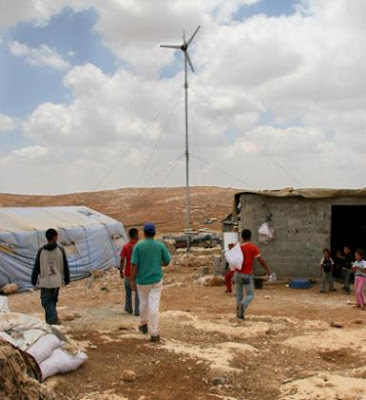 In the village of Susiya, not having electricity keeps them in their own dark age. So for Samia Shineran, 30, who has been making goat's butter by hand since she was 10, the installation of a powered churn in the family tent this spring was an unalloyed delight, giving her that much more time for the many other tasks which fall to this Palestinian mother of 10. "This is better," she says, beaming. It is easy work now. Women clean the dishes, deal with the sheep and goats, take care of the children. "I can do more things every day now and have social contact with other women." Her horizons now widened, she would ideally like an electric pump to ease the back-breaking task – mainly allotted to women – of bringing buckets up from the cistern holes that are her extended family's only water supply in a community without any of the utilities the Jewish settlers a few hundred metres away take for granted. Mrs Shineran's wish may yet be fulfilled because Susiya, a beleaguered community in the arid, windswept South Hebron hills, now has electricity thanks to a unique renewable energy project. Pioneered by two physicists who have a strong interest in environmentalism and a close relationship with the villagers, the changes, in the words of 32-year-old farmer Hassan Shineran "have brought us from the Stone Age to modern life". Both Noam Dotan and Elad Orian, who came to help the Palestinian Arabs in this impoverished, conflict-scarred tract of the southern West Bank, happen to be Israeli Jews. Although Palestinian shepherds and farmers first subsisted here in caves at least 200 years ago, the 14 extended families of Susiya came here as refugees, expelled from their Negev village in the war of 1948. While the 1967 Six-Day War brought their adopted home under Israeli military control, the real troubles of the Susiya families, like many others in the South Hebron hills, really began in the 1980s. That was when Jewish settlers – some notably hard-line – began to establish communities across the area. Because the new settlements were surrounded by closed military "security buffer zones" – often including Palestinian grazing land and key water sources – the settlers were able to exploit the old Ottoman law that land not worked for three years passed automatically from its previous owners. The problems were compounded by the discovery of the remains of an ancient Jewish town; today it is squeezed between an Israeli settlement, an archaeological park and a military base.